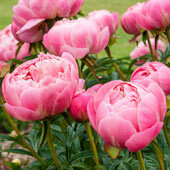 Captivate visitors and neighbors with the loveliness of Peonies. These gorgeous perennials are famous for their spectacular blooms, beautiful greenery and rich fragrance. 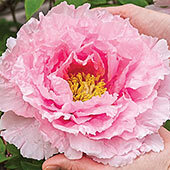 Available in a variety of red, white and pastel shades, peonies feature an abundance of big, sumptuous flowers that bloom amid luxuriant deep green foliage in a much-anticipated summer spectacle. 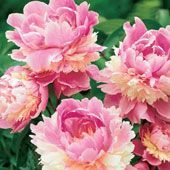 Remarkably easy to care for, peonies are grown from tubers planted 2 inches deep and 3 to 4 feet apart in well-drained soil. They thrive in zones 3 through 8 in full to part sun, and they grow up to 3 feet tall with magnificent 5- to 7-inch blooms. These stunning yet hardy plants don't mind chilly winters, rarely need fertilizer and are resistant to deer and disease. 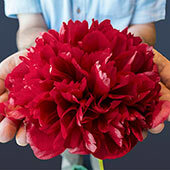 They occasionally require staking, because the big, heavy flowers sometimes weigh down their stems. 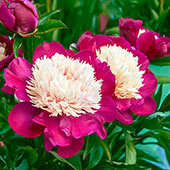 Although dividing is not necessary, it is possible to divide peonies plants and share them. 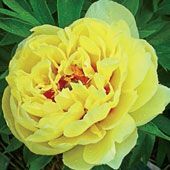 Because these hardy perennials can live as long as 100 years, peony plants may be passed down through several generations. Shiny, attractive leaves stay green long after the peonies' flowers have gone, so they are well-suited for borders or walkways, especially in places where their fragrance may be enjoyed by passersby. Elegant and stately standing alone, they can be truly spectacular mixed with other varieties. 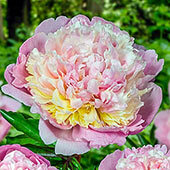 Soft, pink peonies are a brilliant match to varieties with fully double white blooms. 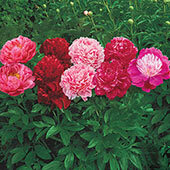 Or complement red and pink cultivars with bi-coloured peonies. Layers of pink and white resemble a creamy parfait, while yellow and white bi-colours lend a cheery air. 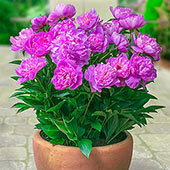 Peonies also make lovely companions to roses of any colour. They are outstanding as cut flowers and are favorites for elegant bridal bouquets. 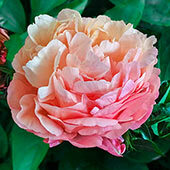 Choose these splendid flowers for your garden and you'll enjoy their colour, charm and sweet aromas for many years to come.